How did the Chamber get started? A group of local residents and business owner’s felt that a legitimate Chamber of Commerce should represent the Lake to ensure the quality of the life at the lake and the surrounding area is maintained. Therefore, the Johnson Lake Area Chamber of Commerce was formed. We intend to be involved with and close to the issues that face the Lake and feel it is a primary function to accurately report on those issues and try to have a positive affect on potential outcomes. The mission of the Johnson Area Lake Chamber of Commerce is to provide a unified voice to promote the business, residential and recreational quality of life of the community. The mailing address for the Chamber is 29 Mallard Cove, Johnson Lake, NE 68937. It’s as easy as filling out an application and paying the dues depending on your type of membership. Call Kathy Fowler at 308-627-3895 or e-mail: and an application will be sent to you. The link is an online, printable application in pdf form, requiring Adobe Reader. To download an application, click here. Why should I Join? 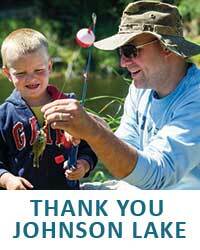 Besides being a part of the only group focused on the betterment of Johnson Lake? • Keep businesses on the lake. • Promote watercraft education and safety. What are the benefits to join the Chamber? Investment dues from its members finance the Chamber. Additional funding is accepted by individuals and businesses that wish to sponsor a special event or betterment committee/effort. Where is Johnson Lake Located? We are located 8 miles south on Hwy 283 from Lexington NE; exit 237 off I-80 & 6 miles north of Elwood if starting from the golf course. Define the Johnson Lake Area? We consider it an opportunity to work with communities including and not limited to Cozad, Kearney, Elwood, Lexington, Eustis, Holdrege and Gothenburg. Residents and businesses of Johnson Lake have and will continue to support companies located in these cities…doing our best to “keep it local”. Johnson Lake, Gallagher Canyon, Elwood Reservoir & Plum Creek Canyon consist of a nine-mile segment of the Tri-County Canal and is the most scenic area along this 75 mile canal. Johnson Lake and Gallagher Canyon have developed campgrounds managed by the Nebraska Game and Parks Commission, while primitive camping is available at nearly any suitable location along the canal right-of-way. The four combined lakes have 4,000 water surface acres, and provide the sportsman with a wealth of fishing for Walleye, Bass, Crappie, Perch, Stripers, Wipers, Catfish and Bullhead. Whether it’s recreational boating, fishing, swimming or camping this area is a must to explore and enjoy! Where can I stay and eat while I visit Johnson Lake? We have listings of all our members in the lodging and restaurant business. You can look for hotels/motels, bed & breakfast, restaurants or campgrounds on our web site or contact us for a directory. I am interested in moving and/or starting a business at the Lake, who should I talk to?